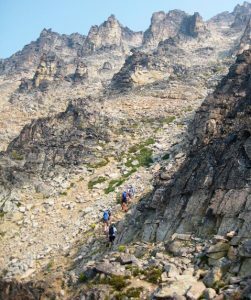 For our 15th annual Mid-Summer Climbing Trip I teamed up with Jon, Todd, Eric, and Adam for a bid on Black Peak and Corteo Peak near Rainy Pass. This was actually a consolation trip, because our original plan was scuttled by the pervasive heat and smoke. If we initially wondered how much fun could be had when an extreme-heat warning coincides with an air-quality advisory, the answer soon became pretty clear: A lot! An unexpected benefit of the heavy smoke was that it filtered out most of the sunlight, so the forecasted extreme heat never manifested itself. Day 1: We arrived at the Lake Ann Trailhead before noon and were immediately struck not only by the poor visibility but also by the strong odor of wood smoke hanging in the air. 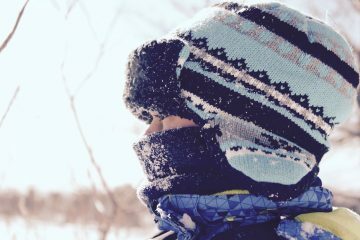 Remarkably, we became desensitized to the smell within a half hour and never really noticed it for the next several days. 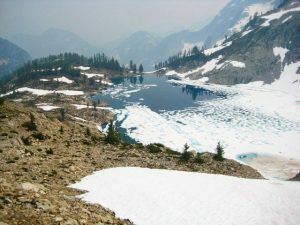 We hiked up and over Heather Pass and down to Lewis Lake, which called out for a cooling dip. 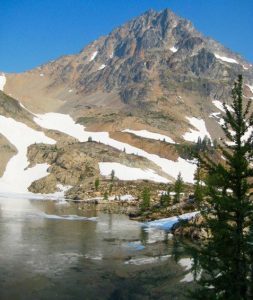 Then it was onward to Wing Lake, where we established camp on a larch knoll above the north shore. The lake was still partially iced over, but that didn’t keep us from taking another cooling plunge. The 32-degree water here made for a very quick plunge. Because the bugs (gnats, mosquitoes, and flies) were so bad in camp, we ate dinner next to the chilly lakeshore, underneath the smokey-gray face of Black Peak. Day 2: We awoke to see heavy smoke everywhere except for a patch of pale blue sky surrounding Black Peak. This atmospheric auspiciousness was the only motivation we needed to head for the summit. 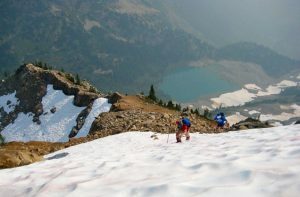 We circled around the lake and ascended an easy snow couloir that led to the south ridge. There was a solo climber ahead of us and a pair of climbers behind us; otherwise, we had this very popular mountain to ourselves. From above Wing Lake, we could see that it was approximately 70-percent ice covered…but melting out quickly. After reaching the south ridge, we turned right (north) and ascended a broad scree- and-talus chute for about 1000 feet. At a high platform above the chute, a rightward traverse took us around to the northeastern edge of the summit block. A short Class 3.5 scramble on good rock led to the top. We reached the summit in late morning (2.1 hours from camp). Visibility was limited to a scant mile, but Black’s craggy satellite peaks were impressive in the ominous haze. 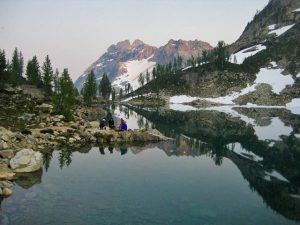 We made a leisurely descent to camp, arriving in the early afternoon and discovering a party scene at Wing Lake. There were a dozen or more tents pitched around the lake, and more people were rolling in every half hour. 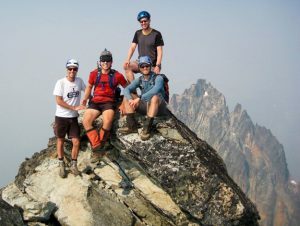 The troops included six climbers who were in the middle of a marketing photo shoot for MSR equipment. You might guess that the abundance of people and pleasant weather would devolve into alpine hijinks, and you would be correct. 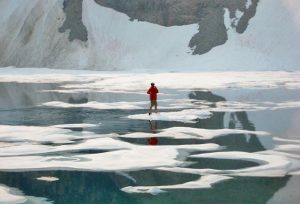 One person from the MSR group ended up on a small iceberg in the lake and then spent an hour trying to paddle back to shore. This whole raucous environment was quite a contrast to the previous quiet afternoon. Day 3: We awoke with high hopes of seeing clear skies all around, but it was just as smokey as ever. The rising sun hung in the sky like a Martian orb (although none of our cameras detected the strong red color). By the time we left camp, small patches of semi-clear sky were letting some sunlight through. We descended several hundred feet to reach the bottom edge of the Lewis Glacier (now just a snowfield), then cramponed up to the top-left corner of the glacier, where snow laps onto a level shoulder. 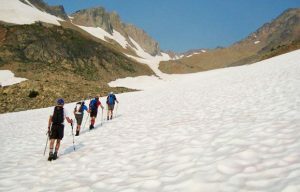 We crossed over the shoulder and ascended a steep slope covered with sand, talus, and snow. This slope ended at a 7600-foot gap in Corteo Peak’s northwest ridge.We followed the ridge crest downward for a hundred yards to a lower gap, then descended steep but easy sand slopes to the large western cirque. From the cirque floor, a beeline was made for a deep notch in Corteo’s south ridge. 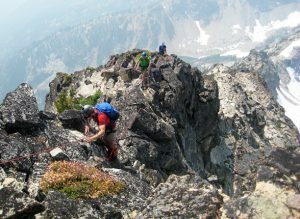 At the notch, we roped up and began simul-climbing along the south ridge crest. This ridgeline offers enjoyable Class 3-4 scrambling on blocky granite, with a few zones of shattered rhyolite tossed in to keep things interesting. We reached the roomy summit in early afternoon (4.7 hours from camp). Visibility was slightly better here than on Black Peak the previous day. We carefully down-climbed the ridge crest with the protection of running belays, then retraced our back across the cirque, over the northwest ridge, and down the Lewis Glacier. It was early evening when we arrived at camp, and by now all of the weekend hikers and climbers had packed up and left. 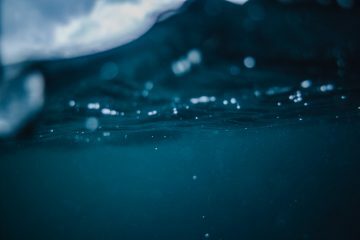 The lake once again felt peaceful and silent. We ate dinner on a rocky projection and watched the filtered evening sun wash over Corteo Peak, while Eric vainly tried to explain the meaning of transfinite numbers, surreal numbers, and aleph-one. Perhaps we were too distracted by the alpine ambiance. Day 4: The morning sky was again very smokey except for a deep blue patch around Black Peak. We were packed up and ready to hike out by 7:45am. it was interesting to see that a veneer of ice had formed on Wing Lake during the night, confirming our feeling that this was a cold lake! Approximate total stats: 15 miles traveled; 8000 feet gained and lost. The Battle is On…Warriors Needed!